In LibAnswers, you can choose to display either your full name or a nickname while chatting with patrons in LibChat. 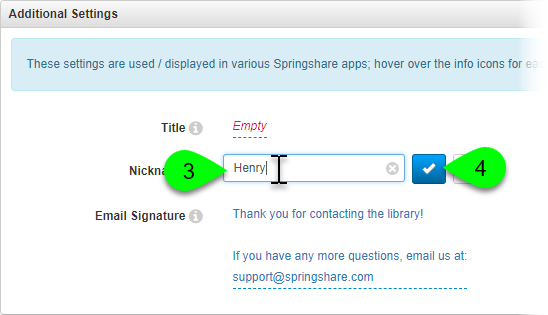 For example, if you only want your first name to display, or something generic like "Reference Librarian", you can do so by setting a Nickname in your LibApps account. From the LibApps dashboard, click on My Account (or your email address) in the command bar. In the Additional Settings box, click on the current value in the Nickname field. Enter the nickname you want to use. Click the checkmark button to save.